You can access the User Manager by clicking on the User Manager icon in the Control Panel, or by clicking on 'Users' in the 'Site' menu on the back-end of your Joomla! installation. Delete. To delete one or more access levels, select them and click Delete. The selected levels will be deleted. 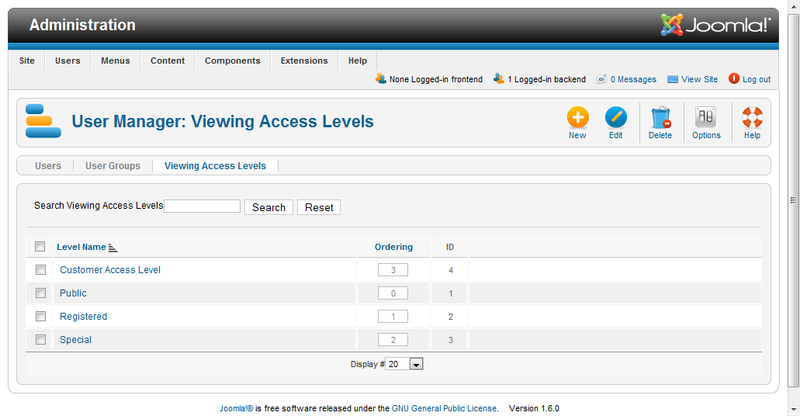 Note that you can not delete an access level that is currently being used. If you try to delete an access level that is assigned, a message showing where it is assigned will display. Enter part of the level's name and press the Search to find matching names. Press Reset to clear the search field and restore the list of levels.